Robert Applebaum is a Certified Health Physicist, CHP, Emeritus. Below is Applebaum’s response to an attempt to increase radiation exposure limits, through the US NRC. Currently, the same players, Calabrese et al., appear to be trying to get the US EPA to increase radiation exposure limits. These limits are for the general population, through legal discharges into the environment. They are not for nuclear workers. Calabrese’s group (SARI) delivered a “special pleading” letter to Pruitt in March of 2017 and, in the interim, it was apparently spun and repackaged. In March 2017, Mark Miller, who retired from Sandia National Nuclear Lab, and who has solar panels on his own house, signed the SARI letter-petition to Pruitt. Carol Marcus and Mohan Doss also signed onto the March petition and have commented on the current EPA proposal. All three are mentioned below, along with Calabrese. Yellow highlight-red underline was added. PRM 20-30 states that Dr. Mohan Doss is acting on behalf of SARI and “supports and supplements” PRM 20-28 submitted by Dr. Carol Marcus. It should be noted that Doss, Marcus and Mr. Mark Miller (who submitted PRM 20-29) are all members of SARI. The additional reference material submitted by Dr. Marcus was authored by other SARI members. LNT is not a hypothesis. It’s an explanation which ties together many tested hypotheses. It’s a scientific theory. Those who feel compelled to attack a scientific theory (evolution, anthropogenic global warming, LNT, etc.) will often attempt to denigrate it by referring to the theory as a “hypothesis”. Scientific theories cannot be proven true, but they must be falsifiable. Since scientific theories cannot be proven to be true, they are frequently subject to attack by those with non-scientific agendas. For example, the scientific theory of evolution is supported by many tested hypotheses, but is constantly under attack by some who feel the theory threatens aspects of their religious beliefs. The theory of LNT was strongly attacked in the late 20th century, when it was unclear what the primary carcinogenic components of cigarettes were. In addition to possible chemical carcinogens, tobacco was known to include naturally occurring radioactive isotopes. It was also recognized that naturally occurring radon progeny could attach to smoke particles and be inhaled deeply into the lung. Regulation of second hand smoke was particularly threatening to the cigarette industry. The Tobacco Institute (TI), a trade group representing cigarette manufacturers, funded a small group of people with science degrees to manufacture and disseminate misinformation in order to slow regulation of cigarettes and second hand smoke. One beneficiary of TI funding was the late T.D. Luckey, who proposed that radiation was beneficial. He called this process “hormesis”. In promoting his propaganda he actually employed the pseudo-science of homeopathy as being supportive: http://giriweb.com/luckey.htm. Ultimately, science prevailed and the TI disbanded. However, it was widely recognized by some Libertarians that the TI’s tactics had been very effective at creating public confusion and slowing the regulatory process. T.D. Luckey went on to start the International Hormesis Society with another former TI funding beneficiary Edward Calabrese. The talking points of the petitions contained within this docket are essentially a resurrection of the propaganda originally manufactured by Luckey and others and perpetuated by Calabrese. It should be noted that Calabrese is an “expert” with the Libertarian Cato Institute, which was originally called the Charles Koch Foundation (one of the Koch Brothers), and it exists to manufacture and disseminate anti-regulation propaganda. The SARI petitioners are attempting to short-cut the rigors of science with their petitions, a fallacy known as special pleading. 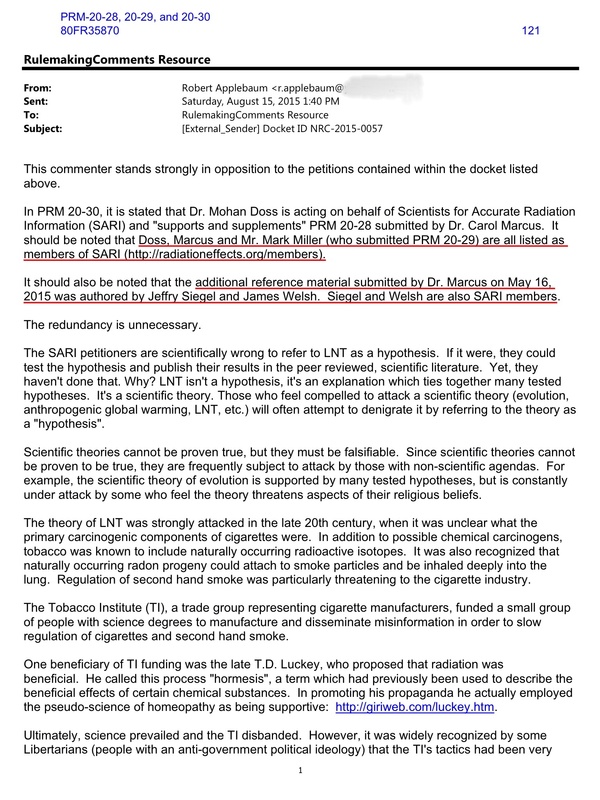 Though the petitioners appear to have scientific credentials, they are conveniently bypassing the scientific process and are engaging in rhetorical tactics (letters, petitions, and website). The SARI petitioners should have learned at the high school science level, that a scientist must produce evidence (hypothesis testing) which is accepted by the scientific community in order to overturn a scientific theory. The petitioners are free to publish their evidence to contradict the theory in the peer reviewed scientific literature. Should any of the authorized scientific consensus bodies change their conclusions based on this new evidence, the U.S. NRC would be compelled to consider revising its regulations. However, modern scientific consensus bodies with the legal authority to draw conclusions on radiation effects are all unanimous in regards to LNT. Since LNT is the scientific consensus theory, the U.S. NRC has NO choice but to implement regulations based on that accepted theory. One of the most ardent efforts to disprove LNT was undertaken by the U.S. DoE Low Dose Radiation Research Program. After spending a decade and over $200 million, they failed to find any evidence to contradict LNT. 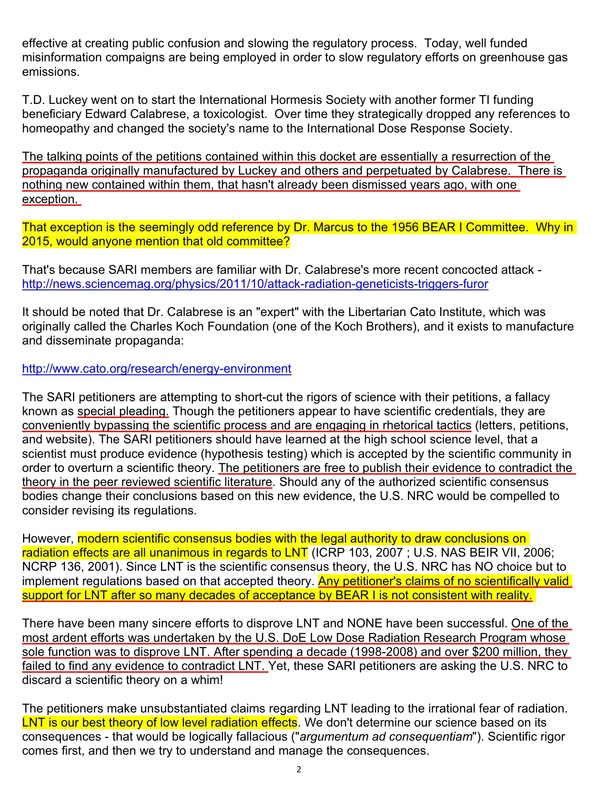 The petitioners make unsubstantiated claims regarding LNT leading to the irrational fear of radiation. We don’t determine our science based on its consequences – that would be logically fallacious. Scientific rigor comes first, and then we try to understand and manage the consequences. It is important to note that there is nothing “low dose” about 100 mSv. It is actually the start of medium dose. We respectfully disagree with the last statement, which somewhat spoils two otherwise brilliant pieces. While it is important to understand that low doses of ionizing radiation are not a guaranteed death sentence, which may be his point, it is difficult to see how even the 1 mSv to which the nuclear industry is allowed to expose the general population is acceptable (0.25 mSv for the EPA, except thyroid dose at 0.75 mSv). For risk to be acceptable it must be chosen by the person, and there must be some benefit. A smoker may get joy from smoking which outweighs the risks. Someone forced to breathe second hand smoke does not get joy from it, nor is there always choice, as when a smoker walks (or drives with windows open) down the street in front of you, so that s/he doesn't have to smell the smoke but you do, plus the second hand smoke contains polonium, used by Putin to poison his adversary, Litvinenko in London. Litvinenko suffered a fairly quick and painful death from polonium. Others suffer slow and painful deaths due to polonium in cigarette smoke and radioactive discharges from the nuclear industry. Mr. Applebaum may also have some medical uses in mind. If you break a bone, for instance, an x-ray may be required. In this case there is a benefit and there is usually some choice. Today most medical uses of ionizing radiation are unnecessary. There are new technologies (MRIs, Ultrasounds), which may have been unavailable when Mr. Applebaum trained, since he seems to be retired. They have also improved over time. Unfortunately doctors appear to be increasingly trying to force outdated, often unnecessary, tests upon people, which involve ionizing radiation. There is no choice with radioactive effluents from the nuclear industry and its wastes. This risk is forced upon a public which generally doesn’t even realize that the nuclear industry is legally allowed to routinely discharge radioactive materials into the environment. According to BEIR VII (ca 2006), over a lifetime, 1 mSv of nuclear industry effluents leads to an approximate 1% excess cancer risk. The impacts are stochastic, i.e. random. You might dodge the radioactive bullet, but you might not. Calabrese, cited by Trump-Pruitt’s EPA, and other members of SARI have pushed for a 100 mSv (or greater) exposure for the general public, per year, or 400 times plus the current US EPA limit of 0.25 mSv. According to BEIR VII, 100 mSv per year would result in approximately 80% of the population getting cancer over the course of a lifetime. According to calculations based on Richardson, et al. (2015) this figure is much higher: 20 years of the 100 mSv promoted by Calabrese et al. would result in at least 80% of the exposed population getting cancer, from this exposure alone, and around 40% dying of life-shortening cancers. These cancers would be those appearing within an average of 26 years. More could appear later. These are what BEIR calls “life-shortening” cancers. Remember that this exposure limit is for the general population and from routine radioactive discharges into the environmnet. The population has no choice and gets no benefit. Lifetime odds of dying in an assault by Firearm in the US 0.27% (1 in 370). Calabrese quoted by the EPA in its April press release about this comment deadline. SARI sent letter to Pruitt in March 2017.